Long time readers may know that I am a big fan of the HoneyCrisp apple. It's amazing how much you can love an apple variety but there you have it. So I was pretty excited to hear about the new SweeTango apple. 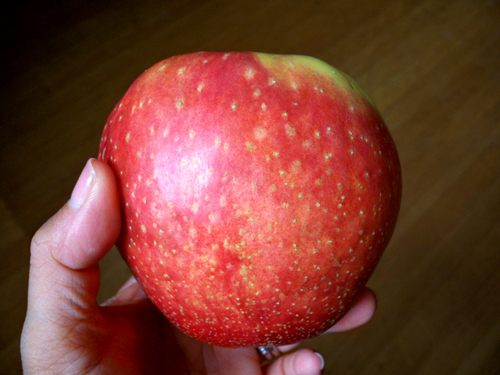 The SweeTango was developed at the University of Minnesota, the same as the HoneyCrisp. The SweeTango is in fact a cross betwen the HoneyCrisp and Zestar! I didn't add the ! to Zestar! on purpose. The ! is part of the Zestar! name. Anyhoo, we are lucky enough to have a local orchard growing SweeTangos and we got a few of them. Oh yahh... they are tasty! My only complaint is the ones we got are so darn big! About half way through one of these bad boys I have to take a break. Not a bad problem to have really. I'm pretty sure the trademarked name is SweeTango with only one T. I know they are delicious ... we have them all over MN. I heard this story on NPR that they're not allowed to grow Sweetangos outside of Minnesota. I'm curious how your orchard got them. They are also grown in Upstate NY. Fowler Farms in Wolcott, NY has a small orchard of the trees with lots of fruit this year.